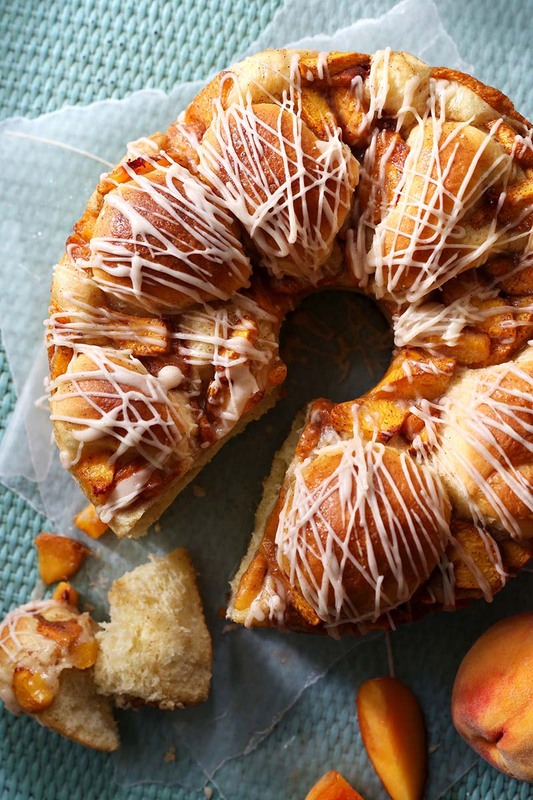 This yeasted breakfast bread is filled with sweet peaches and drizzled with brown butter glaze. The pull-aparts make it perfect for sharing! Combine 2 cups (280 g) flour, yeast, sugar, and salt in a large mixer bowl; mix on low speed until incorporated. Heat milk in a microwave-safe measuring cup for 45 seconds to 1 minute, until very warm (120-130°F). Add warm milk, butter, and egg to flour mixture and mix until combined; mix in remaining 1½ cups (210 g) flour. Switch out the flat beater for a dough hook, and knead dough for 5 minutes until smooth and elastic. The dough is ready when it feels tacky but doesn't stick to your fingers (if necessary, add additional flour 1 tablespoon at a time while kneading). Place dough in a large bowl coated with nonstick spray and cover with plastic. Let the dough rise in a warm place until doubled in size, about 40 minutes. To check if dough has doubled, lightly flour two fingers and press them down into center of dough. If indentations remain, dough has risen enough. When the dough is ready, gently press down dough; cover and let rest 5 minutes. While the dough rests, prepare the filling. Combine butter, brown sugar, cinnamon, nutmeg, and milk in a small saucepan over medium low heat; whisk until melted and smooth. Spray a 10-inch tube pan with nonstick spray; place pan on a foil-lined baking sheet. Turn dough out on a lightly floured board and use a floured bench scraper to cut dough into four sections. Cut each section into six pieces and shape each piece into a ball. Layer the dough balls in prepared pan and top with peaches. Drizzle brown sugar mixture over peaches. Cover loosely with plastic and let rise in a warm place until doubled in size, about 35 minutes. While the bread rises, preheat oven to 350°F. Bake 35 to 37 minutes, until golden and a tester comes out clean (tent with foil after 20 minutes to prevent over-browning). Cool in pan on a wire rack for 20 minutes before removing sides of tube pan; cool 30 more minutes before removing bottom of pan and glazing. For the glaze, cook butter in a heavy saucepan over medium heat, stirring constantly until it foams, turns clear, and then turns a deep brown, about 6 minutes (or microwave, see note below). Whisk together brown butter, powdered sugar, cinnamon, and milk in a small bowl; transfer to a small piping bag. Drizzle glaze over bread and let set before serving. microwave for 3 minutes, or until butter is brown.